Monopoly is one of the most popular board games around, and many of us grew up playing it, as it’s certainly a more than entertaining game to play with friends and family which can last for hours. The classic board game has been made available on just about every gaming platform, so it wasn’t a surprise that a Monopoly minis title was announced. This PlayStation port promises a fresh take on the classic board game with accessible gameplay for players of all ages and skill levels. Upon starting the game up, the only mode is unsurprisingly ‘New Game’. From there, you’ll choose from the game’s eights boards, which include the classic board and the locked future, cheese, and jungle boards. 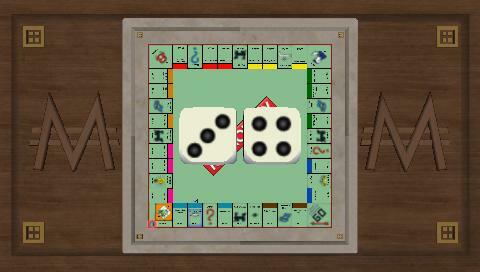 The digital version of Monopoly allows a total of 4 players, and each slot can be set to be played by a friend or the computer. 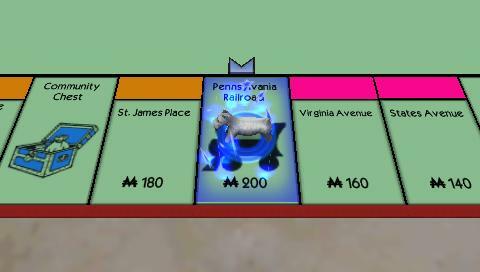 Monopoly’s in-game elements are pretty neat. The game is very responsive and the button layout is accessible. The trade screen, in which you can make a deal with another player, is appropriately detailed, and rolling the dice feels responsive and realistic. However, at times you have to watch the dice topple and slowly come to a halt, which may frustrate players, as it’s something you’d ultimately want to skip. The same can also be said about watching other players, whether AI or friends, move around the board – it’d be nice to be able to skip these somewhat boring parts to make the game move faster. The game as a whole is very simple, from the gameplay to the menu options, but that’s not necessarily bad. Previous video game ports of Monopoly have had too much going on, such as cheesy cut scenes, but the PSP minis version is simple and accessible, which makes it stand out. For example, you buy a property, sort out the deal and then move on–nothing more, nothing less. The presentation is about on the level you would expect for a PlayStation minis title. Everything is clear to read, each card in the board is perfectly rendered, and the pictures have their own stylized animations. Another notable graphical effect is the glow that surrounds a property when it is bought, which differs depending on which character buys it. The snappy visuals are also accompanied by some catchy jazzy tunes. Considering neither the PlayStation 3, Xbox 360, or iPhone versions of the game had any sort of online multiplayer component, there certainly wasn’t a big chance of any sort of online multiplayer interaction coming to the PSP, and hopes for playing with other players around the world were all but crushed when we heard it was coming to the PSP minis library, as minis don’t include online modes. Monopoly for the PlayStation minis service has set a fine example of what a video game version of the classic board game should be: fun, simple, and accessible–topped off with a friendly interface and some eye-catching visuals. The low price, the ability to play this classic with friends and family, and the capabilities which most minis have now – playing it both on the PSP and PS3 – makes for an entertaining minis title which should warrant a purchase for most.